We are looking predominately at the same lineup as last season, with some minor changes. The Angels will be hoping to finally get Zack Cozart back into the lineup, who went down early last season. This would be an upgrade over the Taylor Ward and David Fletcher. These are back of the order names at the moment, who are trying to break their way into a full time role. The Angels signed Jonathan Lucroy, who has been floating around the league the last few seasons. Moving into the top half of the order, you have the best player in baseball hitting second. Mike Trout continues to be the rock of this order, and Justin Upton fit in nicely last season. Albert Pujols and Justin Bour are two lesser power threats, as they continue to pay out the Pujols contract using him as a DH. The Angels have been lacking a true ace for quite some time, and that will be the case again this season. Shohei Ohtani is not going to pitch this year after undergoing Tommy John surgery, and will just DH as he progresses. The AL West is not a bad spot to pitch, and this rotation is somewhat interesting for being middling names with some slight upside. They didn’t go back to sign Garrett Richards, who has missed most his time in Los Angeles on the DL. They also let Matt Shoemaker walk, who was really only good at home during his time with the Angels. Los Angeles did turn to signing Trevor Cahill and Matt Harvey. Cahill is an interesting add, because when healthy he has been sneaky good. He has boasted solid strikeout stuff, and a good ground ball rate, but health might be the biggest concern right now. As for Harvey, he had a short stint with the Reds, where he did improve on some things, but average numbers seem to be what we get from now on with him. He is also moving to the American League, but in a slightly above average pitcher’s park which helps. Andrew Heaney is likely going to headline this rotation, and had 180 strikeouts in 190 innings last season with a low four ERA. He is projected for similar numbers heading into the new season. Tyler Skaggs is in a similar boat, and will need to stay healthy to have any real worth this year. Skaggs has flashed some potential, but his consistency lacks big time. Both have some solid upside, but the numbers should stay fairly consistent with the last few seasons. As far as the rest of the lineup goes, Felix Pena and Jaime Barria will round out some strong innings. Barria was a heavy usage slider type arm, and got out to a hot start, but teams got around on him quick. He has some sneaky good stuff, and there is a chance he can make a few tweaks to be a quality arm within the rotation. 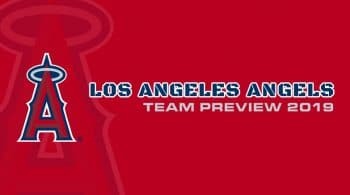 Overall the Angels staff is going to be around the league average mark with room for upside. Outside of Houston, the Angels have the next best rotation. That isn’t saying much with the other three teams really struggling to put it together.